Nonprofits are getting ready for one of the community’s largest philanthropic events: Give For Good. The 24-hour online drive is a challenge for North Louisiana organizations to raise as much money as they can in one day. The incentive? With bonus dollars issued from the Lagniappe Fund and nearly $25,000 in prizes, nonprofits have the chance to take home even more unrestricted funds. In 2017, Give For Good raised more than $1.6 million. There were 173 participating groups, and the event brought in nearly 2,000 donors from across the country. The website, giveforgoodnla.org, is a one-stop shop for philanthropists, and the experience is no different from online shopping. Supporters can find their favorite programs and discover new causes, and donate to multiple organizations at one time. Nonprofits have until Jan. 19 to put their hat in the ring at giveforgoodnla.org. The event is open to 501c3 public charities that provide services in North Louisiana. More information, a full list of eligibility requirements, and FAQs can be found on the Give For Good website. This year’s event will take place from midnight to midnight on May 1, 2018. 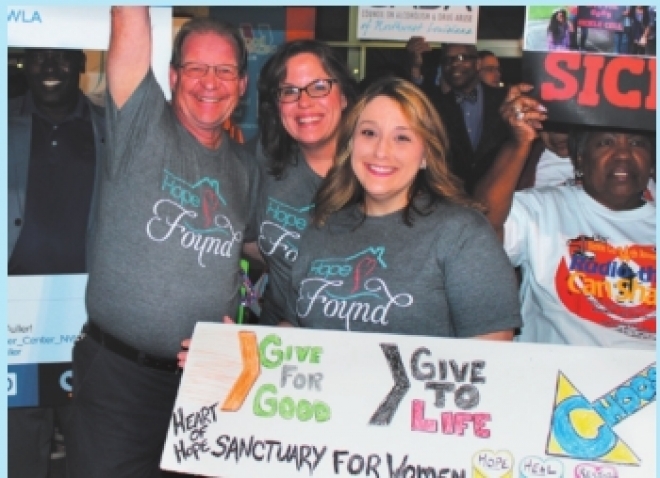 Please contact The Community Foundation with questions at giveforgood@cfnla.org or 318-221-0582. More information can also be found at giveforgoodnla.org. The Community Foundation’s mission is to strengthen communities through philanthropy. • CenturyLink Center is Hiring! CenturyLink Center is seeking applicants to apply for several open full-time and part-time positions. Available full-time positions include: engineering manager and staff accountant. Available part-time positions include: operations staff, security guards, event staff, food and beverage staff, ticket sellers, night auditors and data entry clerk. Job descriptions may be found: http://www.centurylinkcenter.com/career-opportunities/ Resumes may be sent: Via mail: CenturyLink Center, c/o Human Resources Department, 2000 CenturyLink Center Drive, Bossier City, LA 71112. Via Fax: (318) 747-2505. Via e-mail: clinkcenter@gmail.com. No phone calls. CenturyLink Center/ SMG is an EOAA employer, and encourages women, minorities, individuals with disabilities, and protected veterans to apply. Lizzie Hamaker, CFP®, financial advisor at Edward Jones in Shreveport, has been authorized by the Certified Financial Planner Board of Standards (CFP Board) to use the CFP certification marks. The CFP marks identify those individuals who have met the rigorous experience and ethical requirements of the CFP Board, have successfully completed financial planning coursework and have passed the CFP Certification Examination. CFP professionals also agree to meet ongoing continuing education requirements and to uphold CFP board’s Code of Ethics and Professional Responsibility, Rules of Conduct and Financial Planning Practice Standards. The School of Addiction and Behavioral Health (SABH) at the Council on Alcoholism and Drug Abuse of NWLA (CADA) is now open for enrollment for 2018. Classes begin on Jan. 18 and run through December at CADA offices at 2000 Fairfield Ave. in Shreveport. The SABY classes are taught by R. Kent Dean, PhD, LAC, CCGC, CCS with additional faculty to be announced. Kent has been active as a teacher and in addiction and mental health counseling since 1975. He is CADA’s director of clinical development, where he participates in staff development and in CADA clinical education outreach. CADA is an approved education provider for the Louisiana Addictive Disorder Regulatory Authority (ADRA AEP #E017) and the Louisiana State Board of Social Work Examiners. The school’s courses are open to any mental health professional interested in developing and improving their skills for working with individuals and families affected by addiction. The in-depth coursework covers subjects from basic to intermediary, such as Basic Pedagogy in Addictive Disorders Education to DSM-5 Co-Occurring Disorder Differential Diagnosis in Addiction Counseling. Tuition for each class is $75. Classes are limited to 25 students each, and students are strongly encouraged to pre-register before the class. A complete course listing and application is available at www.cadanwla.org/cada-school. For more information, contact (318) 222-8511. Sandy Duncan was named the recipient of the 2017 Adger Public Service Award. 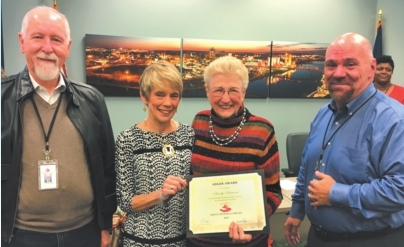 The award recognizes a Shreve Memorial Library (SML) employee for exceptional public service to senior citizens. The Adger Public Service Award was established by the estate of Blanche and Moultrie Adger, long-time patrons of Shreve Memorial Library Broadmoor Branch, because of the outstanding service they and other senior citizens received at the library. Employees may be nominated by a patron, board member or another employee. A complete list of Adger Public Service Award recipients is available at the Broadmoor Resource Center located at 1212 Captain Shreve Drive in Shreveport.